1 Corinthians 13 – The Photo Shoot – What You See May Not Be What You Get! 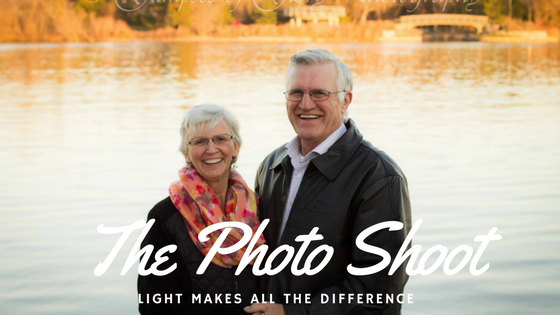 Last fall, my husband and I had our first photo shoot together in over 44 years! The leaves were all but gone on this unusually warm Canadian prairie day in November. With the sun setting, we stood by the water thankful to have passed the difficult seasons of married life. Relaxed in each other’s presence, we deeply inhaled the fresh, gentle breeze. With a hint of sadness, I wished there was more than dried twigs in the background silhouetting our forms. Completely amazed, I viewed our pictures for the first time! The amber warm glow of sunset appeared to surround us making even the brown of waiting winter vibrant in the powerful light. How very much like our lives together! Yet, here we stood with an ever deepening love and respect for each other – the unmerited blessing of God’s faithfulness toward people so unworthy! Yes, in His Light everything is viewed with new perspective. We are able to truly see each other without suspicion or criticism. (This in itself a gentle miracle!) Here in His Presence there are no regrets, judgments, or pain of past failures. In Christ Jesus, we lavishly receive and generously share the joy of togetherness – rich and full. In our capacity, that bar-raising-love stretches to impossible heights for me to ever reach! Yet, at the same time, I know inwardly it is entirely possible as one leans completely into The One Who is Love and delights to demonstrate it to us continually. Thank you for never leaving us or abandoning us to our twisted ways. Thank you for your immeasurable grace, unending mercy and inexplicable favour. Want to read more on relationship? ← Children and Death? How Can We Help? Love you two both! Thanks for the reminder that 1 – there is always an unseen backstory behind the beautiful outside that we see, and 2 – that God can transform and redeem anything into something beautiful that brings Him glory.